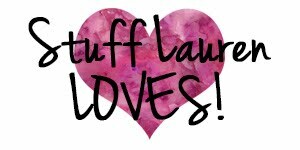 It was a short daycare week (thanks to a couple of scheduled days off for me), but we packed quite a bit into our three days! A few of the kiddos still weren't 100%, so we had some quiet activities and down time planned too. The highlight was ending our week with Halloween cookie decorating! The kids painted a big pumpkin and then we made a "tree" from a half gallon milk jug to put all of the Scratch Art leaves on. Both turned out great! 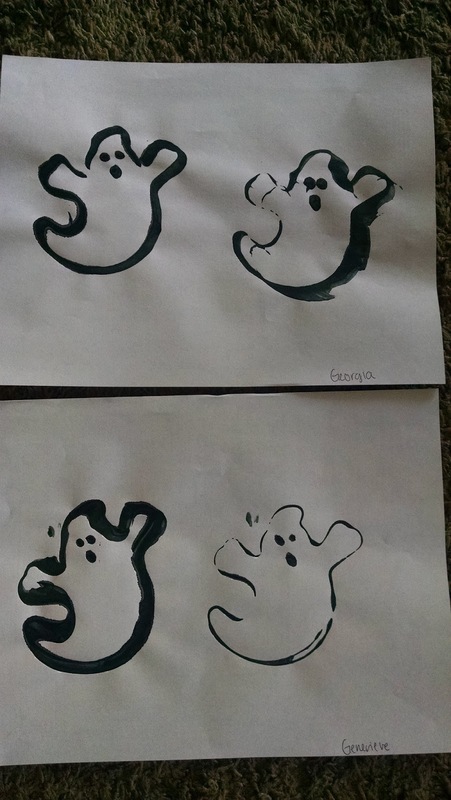 We did a couple of cookie cutter paintings: ghosts (which the kiddos had some help with, obviously!) and Halloween cookie cutter paintings. The cat cookie cutter seemed to be a favorite to use. 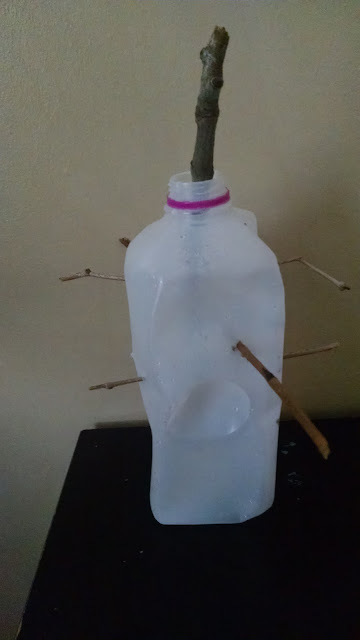 How one and two year olds "build sompting." Dump all of the building toys into a pile, mix them around, strategically place one small toy on the very top, walk away from the masterpiece, and then get mad whenever someone walks too close to it (but they're allowed to stomp on it/fall on it/or kick it). I will say, they did pick it all up and put everything back into the correct bins! I'm not particular about much (you really can't be when working with young children!) but all of the kids are incredibly particular about putting the toys back exactly where they go. There's even been a few meltdowns because a bin or doll wasn't placed exactly where they had found it. 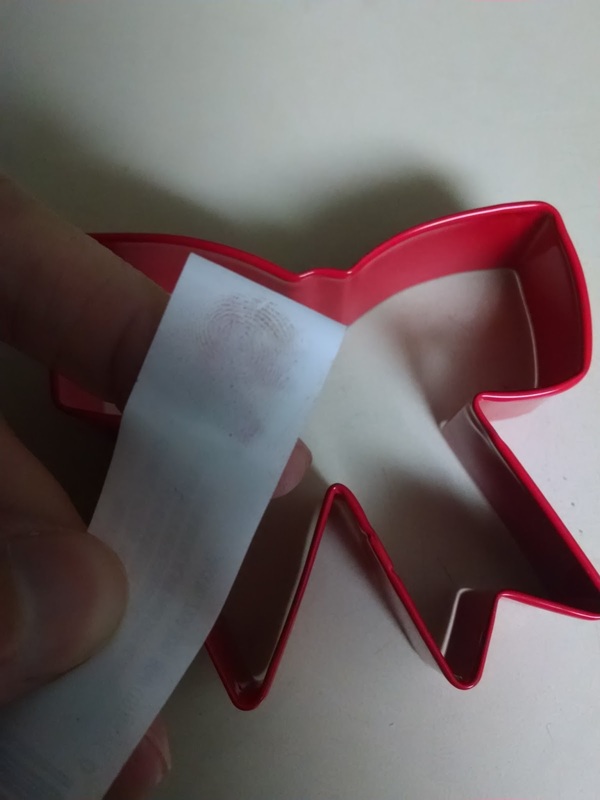 So the cookie cutter picture doesn't have much to do with daycare (other than I bought the cookie cutter for playing with Christmas play dough in just a few short weeks), but I was shocked to find a finger print on the sticker that it took me a while to peel off. I've been reading and watching a few things lately about DNA evidence and transfers. I can completely understand it now. The bigger kids loved getting creative with the sticker face pumpkins. Pumpkin bowling was hilarious! 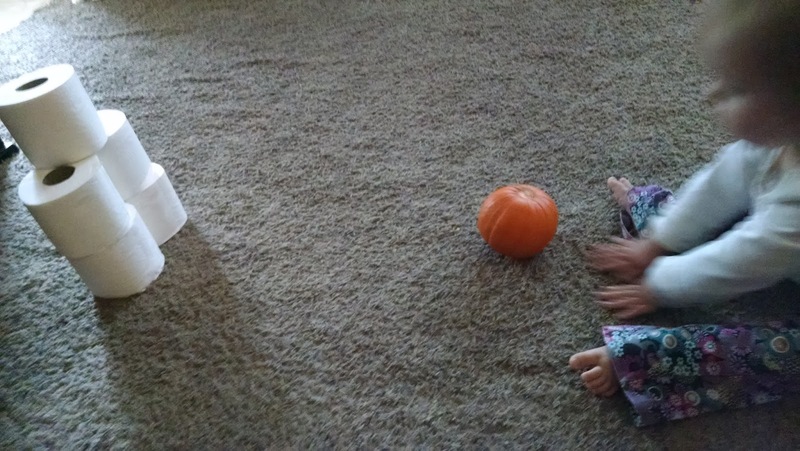 I'm not sure if it was because of how young all of the kiddos are or if they're just really gentle kids (definitely the most gentle group of kids I've had yet), but they oh so softly rolled the pumpkin on the floor, only to watch it get stuck after a few inches of rolling. It didn't seem to discourage the kids though, who just kept lightly pushing it until it rolled into the "ghost" toilet paper rolls. Sugar cookie decorating didn't go as expected either. Since the kiddos are all pretty young I expected a big mess between the frosting and the sprinkles. Instead they were all very careful with the frosting as they didn't want to get any on their fingers and none of them would grab the sprinkles themselves (I had to reassure them all several times that they could touch the sprinkles and put them on their cookie). Half of the kids didn't even eat a cookie because they didn't like the mess! Not what I was expecting at all, but the kitchen remained clean. Play dough and Halloween cookie cutters playing lasted ALL afternoon for the kiddos! And this did make a big mess! I used green apple conditioner and cornstarch mixed together to make the play dough, so it crumpled fairly quickly. "I'm a zombie!!" she said as she chased another child with dirty hands (the other child did not find this funny). The Halloween sunglasses and witches fingers were a hit! 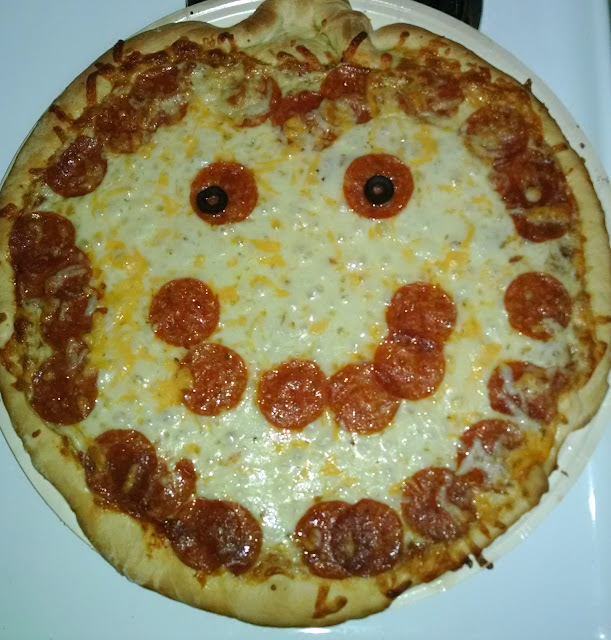 The minis and I ended our week with a pumpkin shaped pepperoni pizza! Next week we'll have one more day of Halloween activities, then have a week filled with fall before jumping into our Thanksgiving theme. We've got quite a few sensory activities lined up for the week ahead, a couple of art projects, and a leaf hunt in the backyard.